For the Mandarin Orange slices, I use Dole, but you can use any unsweetened brand. Fresh spinach powers tons of fiber and lots of flavor and a beautiful green color to eat bite. 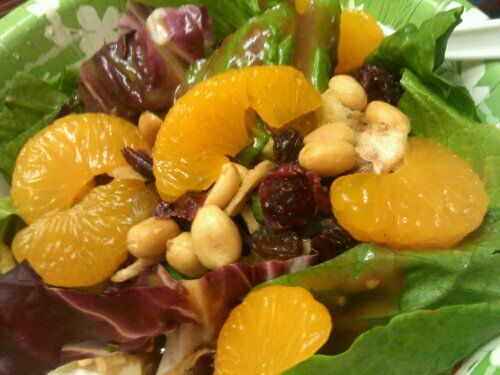 I sometimes add trail mix that has sesame sticks in it for this salad, which gives it a nice crunch and combines well with the Kraft Asian Sesame Dressing. My mom Ramona loved this sald the first time I made it for us, she licked the plate! That was a first! She is with my sister now in Moreno Valley and want to see her for her 82cnd birthday on June 19th. Seems only yesterday I made her two dozen Chocolate Fudge Cup Cakes with Peanut Butter Butter Cream Icing! The smile on her face still gives me JOY to this day. Mom is the most appreciative, kind, good, sweet natured lady you will ever meet and has been my best friend & cheerleader all through my life. I Didn’t Bake These Cakes but the Talented Bakers at FOOD CITY did!